There's something that's hard to resist about Slow Air. It could be Tessa Murray's dreamy vocals, or it may be the laid back, stripped back guitar, synths and drums... but it's a sound that grows on you the more you listen to it. The LP contains 10 songs (40 min, 45 sec), with an interesting mix of styles. I really enjoyed the instrumental 'Welcome to Slow Air' which transports the listener to an exotic climate. 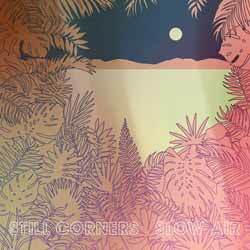 Still Corners are a band you're either going to instantly love or won't be your thing at all. There's an '80s vibe running through the album - part Fleetwood Mac, part The Pretenders in style. It's certainly worth checking out.